With his reception for members of the baseball hall of fame on March 30, the nation may have finally seen George W. Bush's only real interest in the presidency. As an elementary school student he would carry a small baseball bat around with him during the school day, and is remembered by his teachers primarily for trying to put together pick-up baseball games. The family maid recalls that he never had much time to do homework because he was too busy playing baseball, although he struck out frequently. According to a childhood friend, the only thing he read avidly was baseball statistics. Another is convinced that Bush's life goal is still to be baseball commissioner. Doug Hannah, one of Bush's childhood buddies, told Gail Sheehy last year "Running for president is a résumé-enhancer for being the commissioner of baseball. And it's a whole lot better job." The expulsion of high level Russian diplomats following Robert Hanssen's arrest or spying. Secretary of Defense Rumsfeld's declaring the Far East as the most likely arena for military action, and that he wants a force that can fight and win a nuclear war there. The White House pledge to sell arms to Taiwan. White House spokesman Ari Fleischer's indication that European opposition to the proposed missile defense screen would not factor in the administration's deliberations. The effective suspension of negotiations with North Korea. As of March 1, 2001, George W. Bush's approval rating was the lowest of any president at that point in his term for the last 50 years, according to The Economist. Bill Clinton's comparable rating was 63%, George H.W. Bush's was 76%. 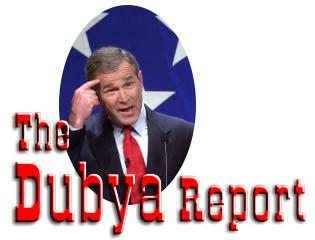 Dubya' s was 55%. And although Bush's rating improved slightly the following week, it declined again the week after that (according to a CNN/USA Today/Gallup poll taken March 9-11). People regarded Bush's handling of taxes, the economy, world affairs, and Social Security no better than his overall performance. Read more about "Intellectual Dishonesty"
Read My Lips: "mandatory CO2 reductions"
187 million pounds of toxic waste into Texas land, water, and air in 1996 alone. Read more about Read My Lips: "mandatory CO2 reductions"
Reuters reported on March 11 that the Palm Beach Post found that the county's controversial butterfly ballot cost Al Gore about 6,600 votes. The now infamous ballot had candidates' names on opposing pages with a row of punch holes in the middle, which confused thousands of Palm Beach County voters. The county is Florida's third most populous, and predominantly Democratic. Congress no longer finds itself trying to reduce the federal budget deficit, but rather, looking for ways to spend the federal budget surplus. Although the Congressional Budget Office (CBO) predicts a non-Social Security surplus of about $3 trillion over the next ten years, Congress must look at these projections closely before it decides to spend the surplus. When George W. Bush said "It's hard to put food on your family" some laughed it off as an example of an endearing personality trait, while others seized upon it as raw material for comedy and satire. Few would have thought that his penchant for occasionally saying the opposite of what he meant would be elevated to administration policy. But in these, the early days of promoting his tax cut initiative, a discontinuity between rhetoric and practice seems to be calculated. Air strike: Danger to allies or Iraq? There is a sense in Britain and elsewhere in Europe that the recent air strikes against Iraq pose less danger to Iraq than to US allies in Europe. The bombing lends credence, at least in the Arab world, to Saddam Hussein's worldview in which he leads a confederation of Arab nations in opposition to western imperialism. And it reinforces a picture of the Bush administration as insecure, aggressive, and prone to drag allies along into conflicts they have no mandate to engage in. Read more about Air strike: Danger to allies or Iraq? Regarding John Ashcroft, Senator Russell Feingold (D-WI) maintains, "A Republican president ought to be able to appoint people of strong conservative ideology." Can you imagine Senator Jesse Helms or Senator Trent Lott uttering those words about a Democratic president and his strongly ideological liberal nominee? Think Lani Guinier. The government's insistence that the US and British air strikes against Iraq are justified under international law is less firmly endorsed in Whitehall than ministers admit publicly, informed sources said last night. Private doubts about the legal basis of the no-fly zones over Iraq resurfaced as angry Labour MPs, MEPs and union leaders gave Tony Blair clear signals that they will be much more sceptical about intimate military cooperation with Washington now that a Republican administration is back in power - even though a general election is just weeks away.